I love happy stories. This blog will detail two very happy events. No matter what the problem that causes wild patients to be admitted to REGI, seeing them recover to be released back to the wild is joyful. Knowing our former patients are successful and thriving in the wild after being rehabilitated at REGI is beyond exciting. 1990's. The magnificent swans are long-lived and usually mate for life. The Trumpeter Swan was native to the Midwest before being hunted to near extinction in the late 19th and early 20th century for their feathers. The feathers were used for ladies' hats. 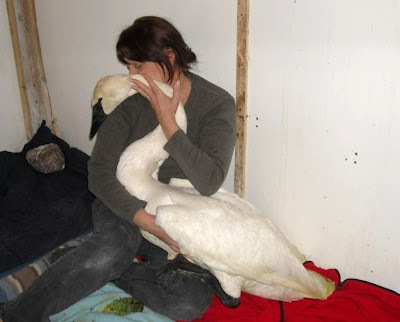 The beginning of the story was difficult for both Trumpeter Swans, as well as those of us who cared for them around the clock. 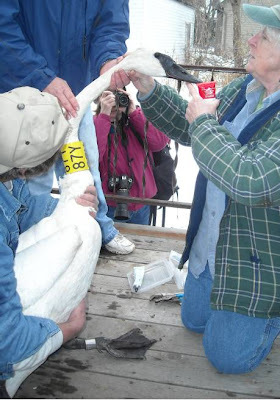 Each year REGI receives many Trumpeter Swans suffering from lead poisoning. Lead poisoning is a human-caused problem. Lead is accessed by swans when they forage on the bottom of ponds, streams or lakes. Our lakes throughout the country have been used for fishing and hunting of waterfowl for over a hundred years. Recently, the use of lead shot has been made illegal for waterfowl hunting in many states. It is, however, still available for use in fishing and other types of hunting. Unfortunately, lead is pervasive in the environment. It does not decompose. It will be at the bottom of bodies of water forever. Wildlife is particularly at risk to contacting the lead shot and sinkers in years when water levels are low. Lead is highly toxic. That is why we no longer have lead in the paint we use in our homes and unleaded gas is used in our cars. The fact is that a piece of lead the size of a grain of sand can poison a human child. You can imagine what a bit of lead shot can do to wildlife species much smaller than a child. When a patient with lead poisoning is admitted, chelation injections begin immediately. Often the patients are suffering organ failure and starvation by the time they are found, caught, and brought to REGI. The recovery process is long, arduous, and very expensive. CaEDTA is the compound used for the chelation process. The cost per patient in medication alone can exceed $2000. 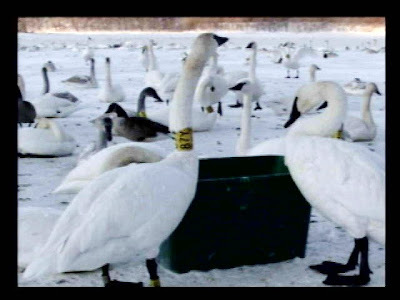 In the spring of 2006 REGI admitted a Trumpeter Swan collared with the number 86C. The number becomes their "name" here at REGI. 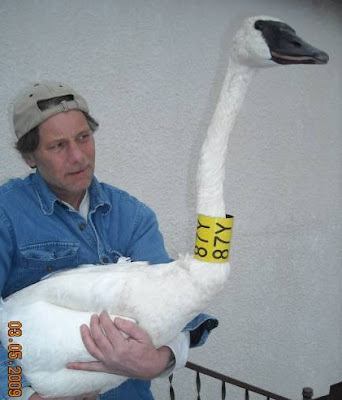 A female Trumpeter Swan, 86C was found weak and lethargic on a lake in Northern WI. She was transported to REGI. 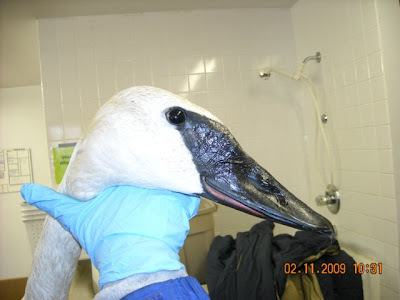 Trumpeter Swan 86C had lead poisoning. Treatment was started and was successful. She was with us for nearly a year before she was fully recovered and ready for release to the wild. I was unable to find photos of 86C while she was in care, but the photo below was taken as she was leaving REGI for release. Barry Wallace is a friend and long-time swan watcher and citizen scientist. He happens to live on the St. Croix River in Hudson, WI which just happens to be where large numbers of Trumpeter Swans gather to over-winter. Barry is allowed to feed them to keep them healthy and in good condition. Barry is a heck of a great person and the hero not only of this story but also of many others. A few weeks ago I got an email from Barry. The subject line was "Hi from an old friend". I opened the email to good news! It seems Trumpeter Swan 86C was back wintering at Hudson with a handsome mate over 2 years after she was released. She was "looking good" Barry said, and while he was not able to get a photo, he was working on it! I was elated!! The next day came another email from Barry. This time he was even more excited than before. He had a photo of a very special swan to both of us. Trumpeter Swan 87Y was also seen, and this time he has a photo! He too had a lovely young mate with him. While all patients are special to us, 87Y has even more history with Barry. The swan will be fifteen years old this spring. Barry has watched him come to Hudson each and every winter for all of those years. Last year it was Barry that pulled him from the river nearly dead and got him to REGI for treatment. This sighting was even more special that most! So, there you have it! Two terrific success stories. Both swans had very high levels of lead in their blood. The lead levels were so high we felt survival would be nearly impossible. We love knowing when our former patients are doing well in the wild. We are confident that most birds released from REGI care do thrive, and having proof is exciting. We are fortunate that the Trumpeter Swans are marked so clearly so we can follow them. 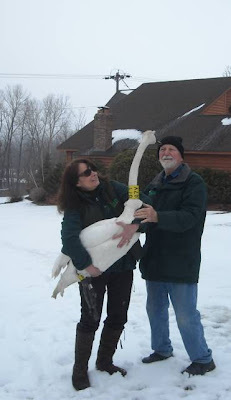 We are also lucky to have someone like Barry Wallace to spend his winters helping the population of Wisconsin and Minnesota Trumpeter Swans survive the winters in a safe area like Hudson. Thanks to Barry, Mary Wicklund and the other wonderful folks out there who do their part to help wildlife get through the long winters. Have a great tomorrow everyone.